David Byrne's latest release, a collaboration with St. Vincent, is a big, sassy, brass-filled celebration of angular rhythms and obtuse observations. If it sounds great (and it does) that's because it also sees him returning to the vibe he had first explored in his earliest solo recordings, such as Songs from The Catherine Wheel and Music For the Knee Plays, and in his production work on the B-52's Mesopotamia. 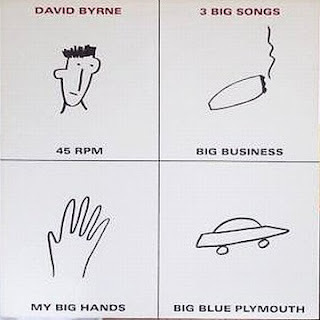 The first of these, the score for a production for Twyla Tharp's dance company, was promoted with a 3 song ep that gathered together the most commercial tracks; while the majority of the album was instrumental, reflecting Byrne's interest in African poly rhythms and FM synthesis, these three were in the mold that the Talking Heads had begun to explore on the mighty Remain in Light album, but with a distinctively experimental edge. "Big Blue Plymouth (Eyes Wide Open)" would become a favourite track in our college dorm rooms; its huge, rousing chorus offering one of Byrne's most out sized and playful takes on America's obsession with the internal combustion engine. My friend Andrew loved this ep so much, he hung up the whimsical cover so that it dangled above our heads like some dadaist mobile while the beats pounded from the speakers. The Catherine Wheel was re-released in an expanded form in 1999. 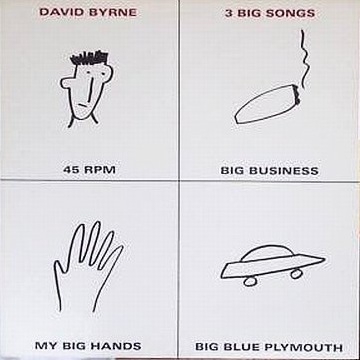 It gathered together the tracks that had been left off of the album version owing to space limitations, but somehow managed to neglect the extended dance version of "Big Business," with its prescient take on the unstoppable avarice of of global capital. Here then is the 3 Big Songs ep, complete and intact. Are your eyes wide open? Orchestral Manouevres in the Dark are set to release a CD and book documenting their performance at the Tempodrome Berlin on 18th November 2010. The package marks the culmination of the band's recent resurgence. Following the reunion tour of Spring 2007, which brought together for the first time in more than a decade the band's founding members, Andy McCluskey and Paul Humphreys, and a well-received album of all new material this past year, OMD are riding high. Once the forgotten sons of the synth pop scene of the eighties, they are now lionized in the press as visionaries who brought together edgy even experimental music with a pure pop spirit, and their sound has become a noticeable influence on a host of a younger bands, including Mirrors and Cut Copy. It is time, then, to take stock. What made this band so unique? 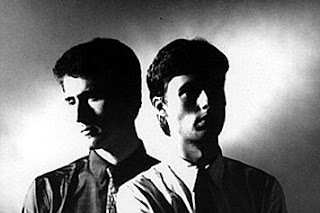 OMD (as they came to be known) were different. They rarely used guitars, as did the early Gary Numan and Ultravox. Nor did they depend overly much on drum machines, like John Foxx and the Human League (Mark II), or the kind of sequencers that could be triggered by drum machines, like Depeche Mode. In their earliest incarnations, when their musical spirit was in its first and fullest ascendancy, their main instruments were often bass guitar (Andy) and a Farfisa organ, occasionally complemented by some wonky Korg monophonic synthesizer or other (Paul). Drawing inspiration from Kraftwerk and Neu!, they played along with Winston the tape recorder, setting Paul's chiming one-finger melodies against Andy's positively propulsive bass and yearning vocals on songs about communications systems and steel mills. And occasionally bursts of static and tapes of distant wireless radio broadcasts burst through the pop sheen. What then of the reunited OMD? A cause for celebration, to be sure, but also to remember just how different they once were. The Second Chameleon and I saw the band several times in the early eighties, including one occasion on which we talked with the band back stage and explained how it was that SC had come into possession of Andy's own personal copies of his early singles (turns out Andy's mom didn't think he'd mind if she gave them to a friend of the family). The early shows, dating from the time of their second album, Organisation, were especially striking, with the core duo supplemented by a drummer and second keyboardist/saxophonist. From Andy's windmilling arms and chugging bass to the gorgeously cascading synth lines of songs like "Almost" and "Messages," the band could hold its audiences positively spellbound. To accompany your pre-ordered copy of Live In Berlin, then, TSM offers a document of another live show in the city from 1980. It's a truly astounding performance, with plenty of rare live outings of b-sides, and an audience keen to push OMD to greater and greater heights of dizzying rapture. By the end of the second encore, when the band has played every song in their repertoire, but the delirious crowd simply won't let the house lights come up, they just start playing the set over again, and everyone goes simply mad. It's a rare document of a rare band. This will be our third and final dip into the world of Virginia Astley after our posts for Promise Nothing and Rarities Part One. These tracks have been gathered from various third-party sources and so some are not up to our usual mastering quality -- but we must be grateful to have them in any form. We thank the primary donor, who apparently wishes to remain anonymous. First we have the Peel session from Virginia Astley, Kate St. John and Nicky Holland, known collectively as The Ravishing Beauties. This was recorded 14 April 1982 by Chris Lycett and broadcast on the BBC's John Peel show 29 April 1982. Percussion was provided by Ben Hoffnung. The Ravishing Beauties were formed when Astley's label-mate Troy Tate (more on him below) invited her to support The Teardrop Explodes over the winter of 1981-2. She called on two university friends for support. This appears to be a different dub of the session than that recently presented by our friend TreeTopClub, so you can choose which you like best. Following this the group made a studio recording of "Futility" (based on a Wilfred Owen poem) before internal pressures forced a split. This version of the song was released only on the New Musical Express compilation cassette Mighty Reel in 1982. How it relates to the version on the Promise Nothing album is a matter of conjecture, but it seems they are mixes of the same session. 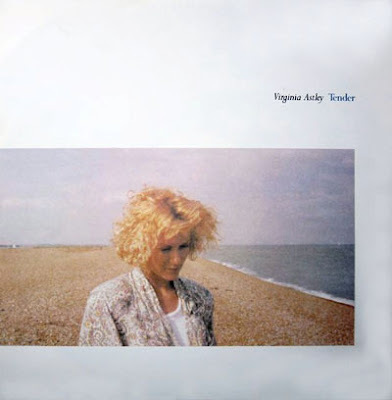 "Le Song (A Day, A Night)" b/w "A Winter's Tale" was a Japanese single released in January 1986. Despite the gap in time, the b-side dates back to the era of The Ravishing Beauties. Even more astounding, the a-side was used for a TV coffee advert! 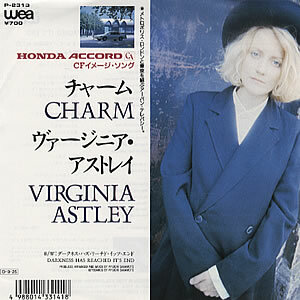 In the same year "Charm" was also released as a single only in Japan and used to promote the Honda Accord. (We provide a shot of the cover, above, as proof!) This conjures up a strange image of an alternate earth in which fey English singers saturate our television sets, enticing us to buy products with their tales of dead children and lost love. In 1981 Les Disques Du Crépuscule had the idea to compile various artists doing covers of songs from classic films. Astley and film-maker Jean-Paul Goude got together under the name The Dream Makers and chose the Philippe Sarde composition "La Chanson D'Helene" from the 1970 film "Les choses de la vie". However the album Moving Soundtracks was not released at the time, so "Helen's Song" ended up on the 1986 double LP re-issue of From Brussels With Love, a compilation with so many different release versions it might make your head spin. Oh yes, do check out that film, by the way, which is a slow burner but has some excellent characterisations and a great car crash scene. There are no lyrics in the film, so it appears Astley made them up herself. "Second Chance" is the sole Astley composition on the 1989 David A. Stewart (yes, Eurythmics) soundtrack for Lily Was Here. That's a film we haven't seen but we must admit this is not the strongest song in the Astley repertoire. The remainder of the tracks are songs by other artists on which Astley provides vocals. The first of these is the 1982 Troy Tate single "Lifeline". Linked only by their releases on Why Fi Records, this release also includes Josephine Wells on the b-side "Kamikaze". It's a minor addition to the canon, but we wouldn't want it to be overlooked entirely. More pleasant is "Now The Night Comes Stealing In", a duet with Kate St. John for her 1995 album Indescribable Night. Finally we have two collaborations with Silent Poets, "Don't Break The Silence" from 1998 and "I Will Miss This Holy Garden" from the following year. Add all this together with the other available files and you have a bounty of Astley material. Please do not forget to run out and buy From Gardens Where We Feel Secure. Though mostly instrumental it is a superlative work. You thought we had gone away, but no, that time is not yet. We still have some goodies for you, this instalment leading the way with some rarities from our own collection. Following on with Virginia Astley we've once again done a special mastering job from a quality vinyl rips where possible, although we start with two cassette originals. Pleasantly Surprised was a Scottish cassette label which put out compilations of some of the best music of the day, largely based on the aesthetic of 4AD. 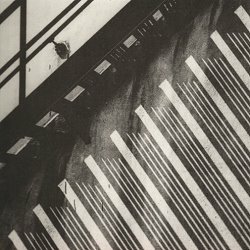 State Of Affairs was released in 1984 and had some unique remixes of Wolfgang Press, Modern English and Cocteau Twins, alongside lesser-known acts: Action Pact, Rubella Ballet and Primal Scream (unknown at that time). Dreams And Desires followed later that year. Unfortunately the tape dubs were of questionable quality, a problem made even more annoying by the fact that many of the tracks are still unavailable in other forms today. "I Live In Dreams" and "Tree Top Club" are demos that come from a recording session with Anne Stephenson and Gini Ball on violin, Audrey Riley on cello, Jo Wells on sax, Kate St. John playing cor anglais and oboe, Russell Webb on bass. As far as I know, none of her other tracks have that line-up. The former song was never otherwise issued, while the second was re-recorded for Hope In A Darkened Heart. "Waiting To Fall" is a track available only on the 1985 Some Bizzare compilation If You Can't Please Yourself, You Can't Please Your Soul, where it sits rather uncomfortably between Yello and Einstürzende Neubauten. It seems that even Stevo was not immune to the Astley charms. Here the instrumentalists are Audrey Riley (cello), Joceyln Pook (viola) and Anne Stephenson (violin). The same group recorded the one-off single "Tender" for Elektra in 1985, four tracks that were not to make it to any album. To finish our collection is the instrumental version of "So Like Dorian", from the "Some Small Hope" 12" single. For this record Astley was working with producer Ryuichi Sakamoto; many of the tracks are sequenced electronically. That's not really to my taste, which is what makes some of these rarities all the more valuable. We believe that none of these tracks are readily available at the current time, and trust you will enjoy them. There are some artists who have had a significant presence in pop while staying very much in the shadows. One of these would be Virginia Astley, whose discography is (mostly) unavailable and in any case entirely obscure to most followers of pop. Born to Edwin (Ted) Astley in 1959, he of "The Saint" and "Danger Man" themes, Virginia found herself in a musical family. Her elder sister Karen married Pete Townshend and her brother Jon was a noted producer and mastering engineer. 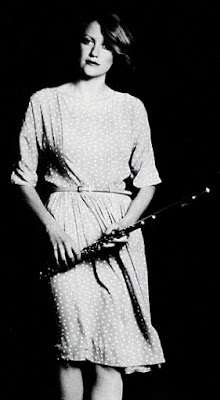 Taking up piano and then flute, Virginia's initial recorded output was as keyboard player with Victims Of Pleasure, who released three singles between 1980 and 1982. During this same period she accompanied Richard Jobson's poetry on The Ballad Of Etiquette and sang on "La Chanson D'Helene" by The Dream Makers, included on the impressive Le Disque du Crépuscule compilation From Brussels With Love. 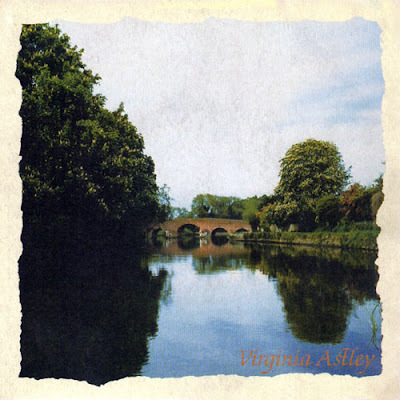 There was little here to suggest that Virginia Astley was soon to release some of the loveliest pop of the era. In fact I missed the release of the 10" EP A Bao A Qu in the first month of 1982 and was equally unaware of the single "Love's A Lonely Place To Be" exactly one year later. But, living in Canada, I was lucky enough to latch onto the compilation Promise Nothing when it was issued. The exclusive Canadian version of this lost album used the artwork from "Love's A Lonely Place To Be". Two versions issued in Belgium on Les Disques Du Crépuscule (in 1983 and 1985) have different, and to my mind completely inappropriate, cover art. What we have here are the four tracks from A Bao A Qu on the first side, and the four from the 12" of "Love's A Lonely Place To Be" on the flip. One track, "Soaring", has been remixed. The last two selections are instrumentals most properly heard on her second album, here used to fill space -- though in the nicest possible way. The result is an extraordinary melding of Virginia's girl-next-door soprano, chamber orchestra arrangements and bitter-sweet lyrics about the death of love. Her brother Jon's production is exemplary, with arrangements that could not be bettered. But it passed through the listening public like a ghost, some five years before its time (if I compare it to the success of Enya's Watermark). This debut was followed by From Gardens Where We Feel Secure, a lyric-free recreation of Hertfordshire ambiance, divided suggestively into Morning and Afternoon sides. Released through Rough Trade in July 1983, this is the only Astley album (out of an eventual five) to remain in print. Incidentally, it marks another Skids connection, being produced by Russell Webb. His sensitivity to the delicate and subtly evolving music is evident. The melding of instruments with location recordings creates an evocative aural space. If you like Promise Nothing, you owe it to yourself (and the artist) to buy a copy of this CD! Virginia was to go on to have a taste of popular success. Signing to Elektra she released Hope In A Darkened Heart in 1986, performing a duet with David Sylvian on the lead-off single "Some Small Hope". This was enough to get the album released throughout Europe and even in the USA. While I dislike Ryuichi Sakamoto's overly slick production and don't think much of the single, the album has much to recommend it. The Astley catalogue is currently in disarray. Hope In A Darkened Heart has been recently reissued in Japan without permission. Other master tapes are lost. Astley herself is not fond of Promise Nothing. Will we ever see a comprehensive re-issue of her catalogue? Visit her excellent website for detailed discography information. We have done a special mastering job on Promise Nothing, replacing three of the tracks with superior CD rips and using spectral analysis to clean out clicks and pops. Unfortunately there is some distortion that simply could not be removed without significantly damaging the music, but it shouldn't be too noticeable. P.S. We are experimenting with offering alternatives to Rapidshare. If you like, you can download from Mediafire by clicking on the appropriate icon above.